A thrilling adventure to experience the wonderful world of dolphins first-hand. These lovely mammals will display their sweetness as well as their most spectacular routines. An excellent lunch and relaxation by the pool will be the perfect end to this unforgettable day. We leave the port and head to the Dolphin Discovery Dolphinarium in Punta Cana, where a truly thrilling experience awaits us. Once there, we are welcomed by the dolphinarium staff, who will take us to the tank where we will have the chance to spend 40 minutes in the water and learn ho to **interact with dolphins**! We cannot fail to be amazed by the power and the speed with which these creatures perform their routines, but above all by their gentle nature. The dolphins will pull out all the stops and charm us with their agile moves and joyous cries. By now **we will be the best of friends** so we will receive a lovely kiss and exchange a friendly "fin shake". As well as swimming around freely with the sweetest mammals in the sea, we can hold on tight for **a thrilling ride on the back of a dolphin** – a truly unique experience! But here comes the most adrenaline-filled moment, the **famous *foot push***: our dolphin friends propel us through the water by pushing us from the bottom of our feet! After our experience with the dolphins, we will enjoy a **delicious lunch** (choice of 4 menus) with soft drinks. We end the day **relaxing in the pool** and come away with amazing memories. 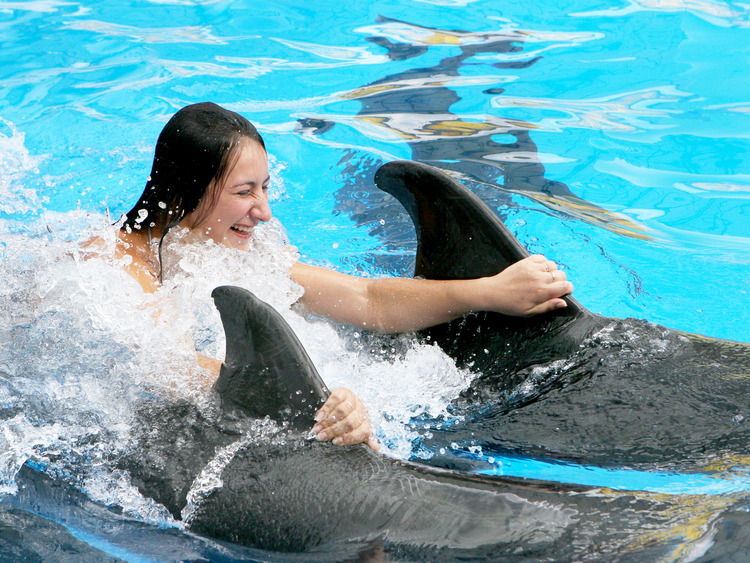 The transfer to the dolphinarium takes approximately 1 hour. The tour does not include a guide; the instructors will provide the necessary information in English or Spanish. Do not forget to bring your bathing costume, towel, sun cream, non-slip sandals or shoes and cash. Pregnant women cannot take part in the activities but can observe from the edge. Minors under 10 years of age can take part on their own if they are accompanied by an adult acting as an observer. * Children under the age of 10 must be accompanied in the water by a paying adult. All participants must wear a life jacket, maximum size available XXL. Participants are advised to wear comfortable clothing and shoes, a hat and sunglasses. We recommend using biodegradable sun creams in order to protect the dolphins and their habitat.